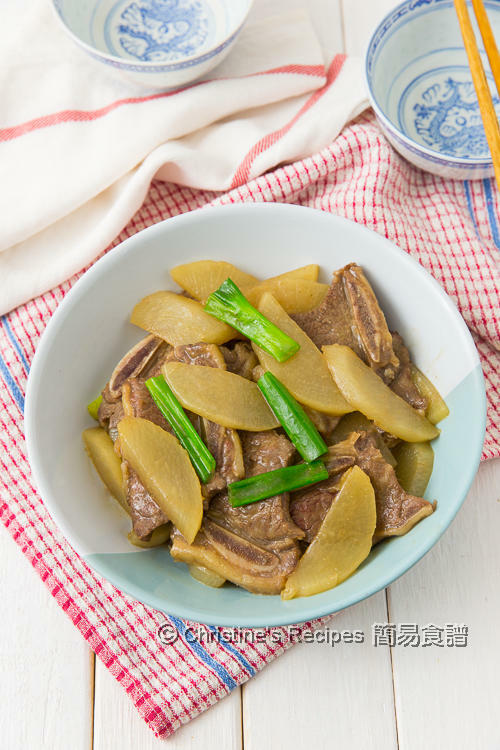 This beef short ribs with radish is very delicious, comforting and nourishing. We like it to go with steamed rice. You might like it to go with noodle soup. It’s all up to you. Radish is used to be very expensive down under here. Recently, there are many beautiful radishes sold at a very cheap price, just under one dollar per kilo. They are young, juicy and sweet. During Chinese New Year, I definitely go for making radish cake (or making radish cake in Instant Pot) for celebration without any doubts. I often like making many other different savoury dishes with radish throughout the year whenever I can get a beautiful radish for a cheap price. Radish goes really well with beef with or without bones. 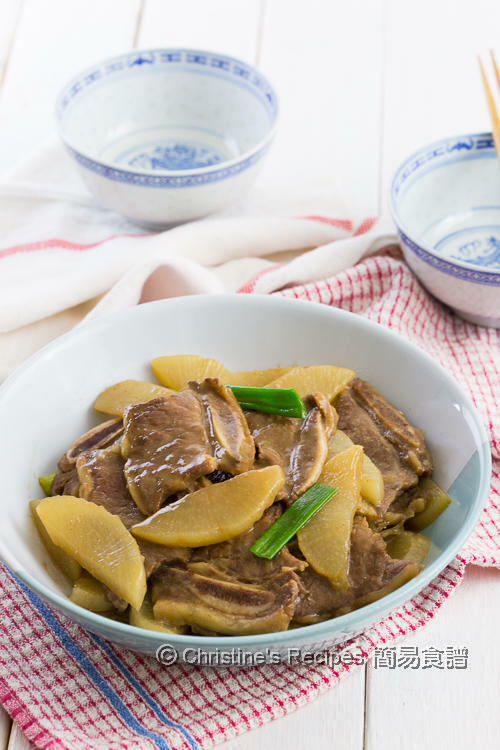 My family likes the classic Chinese dish, beef brisket with radish (蘿蔔炆牛腩). This time I tried beef short ribs with radish. This is also a very delicious, yet easy-to make dish. To get the best results, use thinly sliced ones, not the thick ones. You can easily find some frozen thinly sliced beef short ribs at any Korean grocers or Asian grocers. First of all, get the thawed beef short ribs mixed well with the marinade. Let them set aside for a while to develop the taste. Then prepare the sauce for later use. The beef ribs can be cooked within a few minutes. After pan-frying, they are ready to eat and taste delicious enough already. Set them aside and cover to keep warm. Well, to get the best use of my beautiful radish, I sauté a few ginger slices with sliced radish. Pour in some stock to cook the radish until soft. The radish absorbs the flavoursome stock. Then toss back the cooked beef short ribs. That’s it. 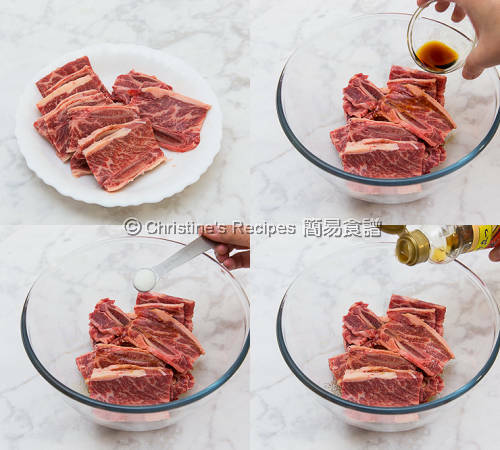 Mix the beef short ribs with marinade well. Set aside for 20 minutes. Peel radish and cut into halves lengthwise. Slice each into ½-cm thick pieces. Heat oil in pan over medium high heat. 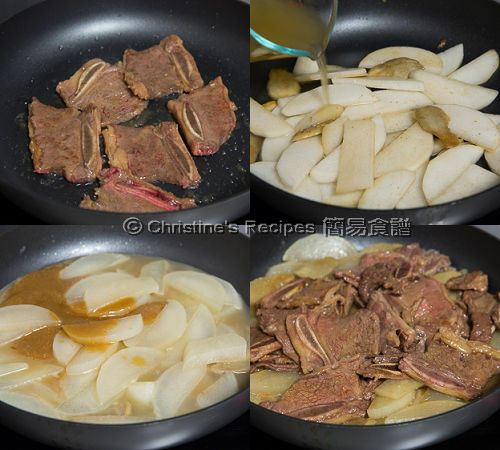 Pan fry beef short ribs until colour of both sides is changed. Sprinkle wine. Set aside. Cover and keep warm. In the same pan, add oil. Saute ginger and radish. Pour in chicken stock. Bring it to a boil. Cover and cook until softened. Remove the lid and continue to cook until stock is reduced by half. Add sauce. Stir in thickening and cook to personal preference. Garnish with spring onion. Serve hot. Beef short ribs are available at supermarkets and Korean grocers. The thinly sliced ones are the best and can be cooked swiftly. 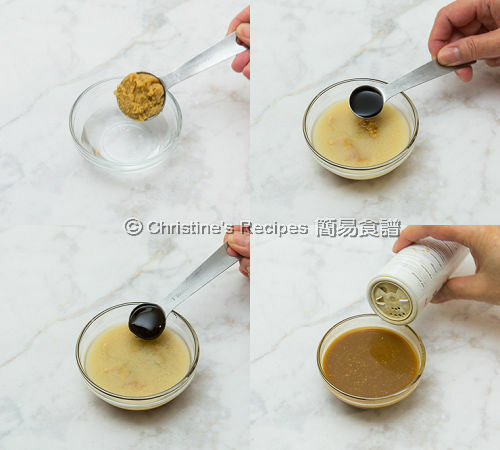 The saltiness of different brands of soy sauce and miso paste is very different. Adjust the amount accordinly. 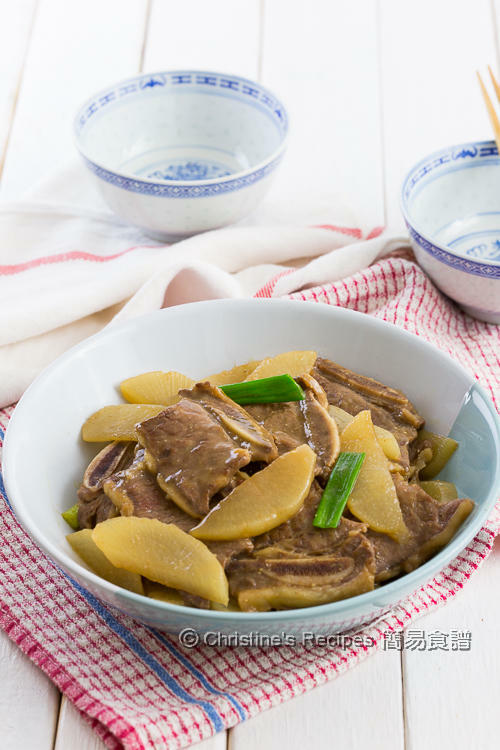 How I miss this delicious classic Chinese beef rib stew! Used to have them very often...and I love esp. those radishes.